Many Americans are wondering what Al Gore has done to even be nominated for the Nobel Peace Prize, let alone win it. After all, what sort of a system allows an environmental activist to win an international peace prize? The Nobel Web site provides some help understanding of how Nobel Peace Prize winners are selected. It tells us that Alfred Nobel, who created the Peace Prize, was also the inventor of dynamite and military munitions. His will provides for an annual award that now amounts to $1.5 million (tax-free) “to the person who shall have done the most or the best work for fraternity between nations, for the abolition or reduction of standing armies and for the holding and promotion of peace congresses.” That helps us understand what Nobel had in mind, and it is clear that he meant for the Prize to go to someone who actually worked for peace, or at least the reduction of hostilities. Looking at past Nobel Laureates, we learn that “Henry Dunant, founder of the Red Cross, shared the first Nobel Peace Prize in 1901 with Frédéric Passy, a leading international pacifist of the time. 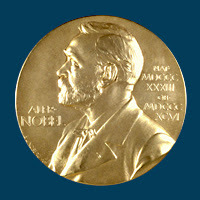 In addition to humanitarian efforts and peace movements, the Nobel Peace Prize has been awarded for work in a wide range of fields including advocacy of human rights, mediation of international conflicts, and arms control.” The first award was a fine start, and the list contains many worthy recipients including Mother Teresa, Woodrow Wilson, Desmond Tutu, Lech Walesa, Henry Kissinger and Dag Hammarskjold. However, we also learn that in 1994 Yasser Arafat, the leader of the terrorist Palestine Liberation Organization, won along with Shimon Peres and Yitzhak Rabin. And looking further back we find out that in 1939 a member of Sweden’s parliament nominated Adolf Hitler for the Peace Prize. Other nominees include Hitler’s fellow socialists Benito Mussolini and Soviet Communist dictator Joseph Stalin, mass murderers all. Apparently, anyone can be nominated for Peace Prize, literally, and sometimes winners may not exactly exemplify Nobel’s noble goal. Nominations of questionable people aside, just how did the Nobel Committee come to award the Peace Prize to an American politician and a panel engaged in the advocacy of a questionable scientific theory that is the subject of heated debate, but neither of which are involved in the pursuit of world peace? Al Gore, after all, has done nothing to promote international fraternity, abolish or reduce standing armies, or promote peace conferences. As it turns out, it requires the application of a generous amount of pretzel logic. Jan Egeland, a Norwegian peace mediator and former U.N. undersecretary for humanitarian affairs, has decided that climate change is more than an environmental issue. "It is a question of war and peace," he has said. "We're already seeing the first climate wars, in the Sahel belt of Africa," where nomads and herders are fighting with farmers because “the changing climate” has brought drought and a shortage of fertile lands. Aha! By citing one conflict over a drought-induced water shortage in Africa, and by assuming that this drought—all droughts?—are caused by global warming, suddenly global warming is a war and peace issue, and Al Gore and the Intergovernmental Panel on Climate Change (IPCC) are eligible for the Nobel Peace Prize. In what columnist Lowell Ponte cleverly called “a sloppy syllogism (or AlGorerithm),” the Norwegian Nobel Committee justifies this by saying that global warming, "may induce large-scale migration and lead to greater competition for the earth's resources. Such changes will place particularly heavy burdens on the world's most vulnerable countries. There may be increased danger of violent conflicts and wars, within and between states." Notice the use of the word “may?” Yes, there “may” be violent conflicts and wars, but then again, there “may” not be. But shouldn’t the Nobel Committee focus on the existing conflicts instead of one that “may” not materialize? But even if we accept the Committee’s logical acrobatics, it must be acknowledged that Man-made global warming is a hotly debated theory among climate scientists; it is not the “done deal” that Gore, the IPCC and the Committee seems to think it is. Al Gore's film documentary on global warming, "An Inconvenient Truth," which won an Academy Award this year, and which is the basis for awarding Gore the Peace Prize, is riddled with factual inconsistencies, according to a British court. High Court Judge Michael Burton’s ruling notes that some assertions in Gore’s documentary were not supported by scientific evidence, and ordered that written guidance to school teachers must accompany screenings for students, to ensure Gore's views are not presented uncritically. The Nobel Peace Prize Committee has jumped onto the global warming bandwagon, abandoned its former focus on efforts at world peace, and allowed political expediency to trample principle. This is not the first time principle has taken a back seat to politics, of course, but it is sad to see that another formerly honorable institution has fallen victim to it.